Be default Basemark GPU only offers PC users the ability to run the benchmark's standard test at 4K High settings using either the Vulkan API or OpenGL API. Further options are only available when we look at the benchmarks custom mode, which allows us to select lower resolutions and the tool's mobile-oriented medium preset. To start off we made things easy, lowering the resolution from 4K to 1080p, a 4x decrease in pixel count, while also reducing the benchmark's detail settings to Medium. This change significantly reduced the GPU load on the system, making things a little bit more CPU or software limited. Looking at every test at these settings, we can see that the Vulkan API offers a significant performance increase in all instances, especially on Radeon hardware, showcasing the potential benefits of a modern API. 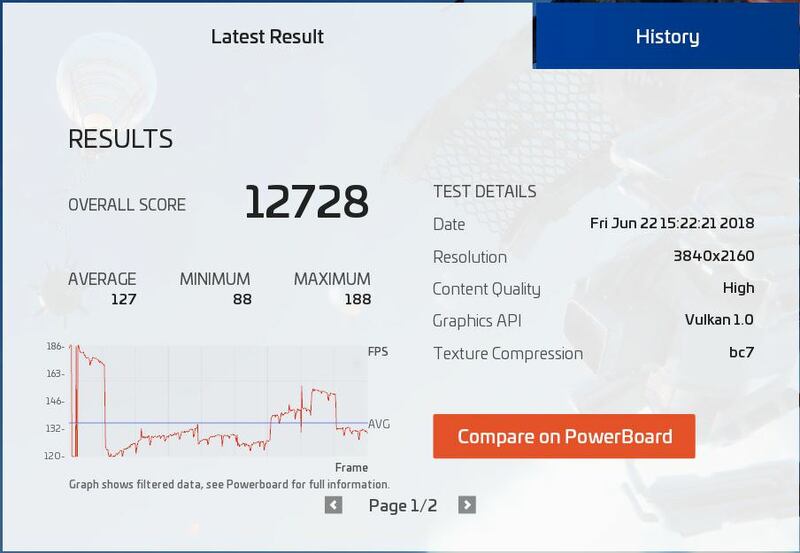 It seems clear the benchmark is CPU limited when using OpenGL, with Vulkan allowing our test system to better access the performance potential of our test hardware. The almost highly similar OpenGL test results on our RX Vega 56/RX 580 and our GTX 1080/GTX 1070 setups seem to showcase some kind of system bottleneck. At high settings, the benchmark's visuals are taken up a notch, though we can continue to see that our OpenGL results for our RX Vega 56 and RX 580 are pretty much identical, again revealing some kind of system bottleneck. Vulkan maintains its significant performance advantage over OpenGL, with Nvidia showcasing higher performance levels than their AMD counterparts in this test. Our ASUS GTX 1060 offers similar performance in both OpenGL and Vulkan, hinting that the game will deliver similar performance on both APIs if the system is not limited by factors outside of GPU compute. Again we can see that OpenGL scores for the GTX 1080 and GTX 1070 remain almost identical.